As Brazil’s runoff elections approach, electoral court authorities and federal and military police officers raided public universities across the country following court orders or students’ requests to question, intimidate, seize materials, and order the take down of pro-democracy statements. While the judges who issued the orders argue the materials seized were used to campaign for the Workers’ Party presidential candidate, Fernando Haddad, many of them did not mention any of the presidential hopefuls. 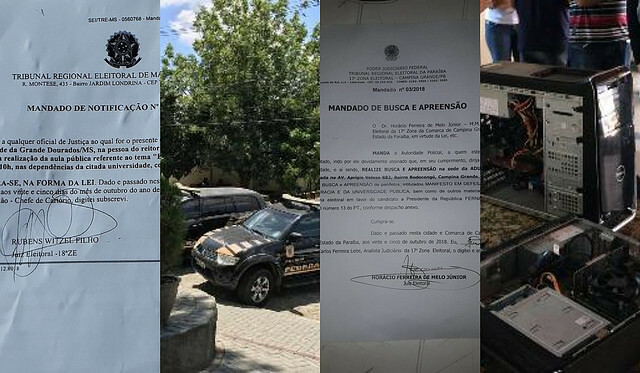 On Thursday morning, armed federal officers raided the Federal University of Campina Grande Faculty Association to execute a search and seizure warrant issued by electoral judge Horácio Ferreira de Melo Junior to seize the “Manifesto in Defense of Democracy and Public University,” signed by the union and endorsed by its faculty members. They also seized the hard drive of the computer of the union’s press office. In Paraíba state, men who claimed to be members of the Regional Electoral Court (TRE) questioned a professor at the State University of Paraíba on Wednesday. The president of the university faculty association, Nelson Júnior, wrote that men wearing TRE gear, but who did not show any ID, stormed into a professor’s classroom after receiving a call reporting that she was campaigning for a candidate. “She obviously wasn’t. The professor was teaching a class based on a movie and they left,” Júnior wrote. “We want professors to continue to teach what they teach. There is freedom of political debate in our society. They cannot ask for votes on university premises, but they can talk about politics and platforms. After all, we live in a democracy,” the president of the faculty association added. Another episode happened on Tuesday, when police officers raided the Fluminense Federal University, in Niteroi, Rio de Janeiro, to take down an anti-fascist banner, even though it did not mention any specific candidate. The São João Del Rei Federal University, in Minas Gerais state, also received a court order to take down a statement from its website in favor of democratic principles and against violence in the 2018 presidential elections, signed by the dean’s office. They have 48 hours to remove the content. “Violence that affects minority groups today in our society – black people, indigenous people, quilombolas [resident of quilombos, settlements set up in Brazil’s rural areas, mostly by escaped enslaved people of African descent], LGBTI+ people, people with disabilities, women – is spreading to groups that oppose the doctrine of one of the candidates. Even the university, a necessarily democratic, plural environment of knowledge, art, and culture production, has been threatened in this context of violence and disrespect for democracy,” the university’s statement reads. While teaching a social media class about fake news in the Pará State University (UEPA), professor Mário Brasil’s classroom was raided by military police agents, as reported by the UEPA Faculty Union. A geographer and professor at UEPA, Daniel Sombra said the incident sets a clear precedent against university autonomy, plural thinking, and respect to social sciences traditions, and is an attack to freedom of thought. Another attack on university autonomy happened when judge Rubens Witzel Filho issued on Thursday a warrant to stop the Greater Dourados University from holding the public lecture “Crushing Fascism,” which was scheduled to take place that same day. At least 17 universities have been raided in the past few days, O Globo newspaper reported.